Windows/10 - To Do or Not To Do? So Microsoft's new version of Windows is now available. Heck, you can even get it for free, if you have Win/7 or Win/8.x. But the big question is: Should you get it?!? Windows 10 comes with built-in spyware. If your work requires confidentiality, DO NOT INSTALL. When you claim your free upgrade to Windows 10, the operating system pulls a nasty trick: it sets your default web browser to Microsofts new Edge. and then there's this little picture of some of the things you'll need to "correct" to have even a semblance of privacy. Plus updates are always "Automatic" - you can't control when you get 'em or what you get. The former is a no go for me since I'm often on flaky/slow internet connections and need to be careful about what goes on behind the scenes when I'm online trying to send an email or read my email. The latter can result in driver conflicts - not all drivers download via Microsoft Update are the correct ones - see the article above. So can you live with all of the above - and anything else it does weird that is not yet discovered? If you have Win/7, WAIT! Check back here and see what I'm saying in January, 2016. DON'T UPGRADE! Read this: Windows 10 is a better Windows 7  if you can get the upgrade to work. Given the problems encountered by the author of that article, plus all the stuff above, I recommend against attempting an upgrade to Win/10 from Win/7. I have no plans to ever upgrade my current Win/7 system to Win/10. If you have Win/8 or Win/8.1: MAYBE! Win/10 does seem to be a better OS than Win/8.x. But there are still all the privacy concerns. And given that it is possible to circumvent some of the privacy attacks in Win/8.x (see below), you just might want to stay with your Win8.x system. If you are buying a new computer, well you might be stuck with Win/10. Be sure to read all the above links (and more below) to figure out how to stop the most egregious privacy problems. When Microsoft announced Win/10 and the free upgrade, I was pleased and had every intention of upgrading a few months after it was released. Now that I see how insecure Win/10 is, I will never use it as my main system (unless these privacy issues are resolved). I figure I'll be switching to Linux when I buy my next computer and running Wine on a dual boot system, using the Win/10 side only when absolutely necessary. Microsoft slips user-tracking tools into Windows 7, 8 amidst Windows 10 privacy storm - PCWorld. Now it appears you have to modify your Win/7 or Win/8 system if you want privacy. The article tells how. Creepy! Good Luck. P.S. I have now uninstalled the updates as the article describes with no problems. It just keeps on getting worse - there are more updates that need to be uninstalled as well as other measures to take. 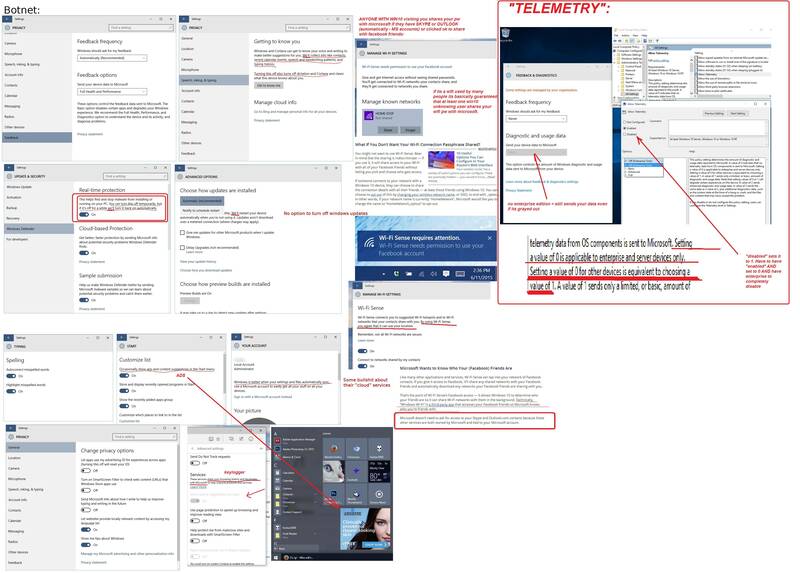 See Stop Windows Telemetry/Tracking/Upgrading to Win10 « alaya:techne. How to Remove "Get Windows 10" App and Its Icon from Taskbar (remove KB3035583). See also this page to remove tracking. Confirmed: How to stop Windows 10 forcing itself onto PCs  your essential guide. Microsoft finally has a proper (and very geeky) way to opt out of Windows 7/8 to Windows 10 upgrades. How to banish the Windows 10 upgrade prompts in Windows 7 and Windows 8.1 - this is all you need to just stop the prompting. Here's how to nuke this [Get Win/10] persistent menace. WAY more work than it should be. The definitive guide to not updating to Windows 10.